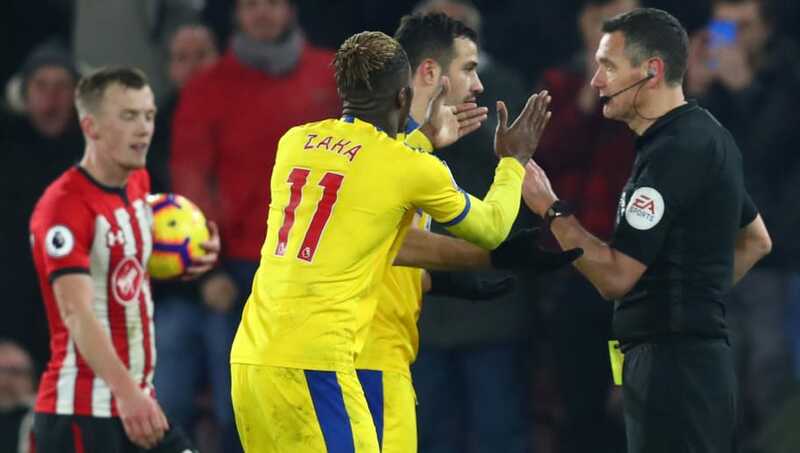 Crystal Palace forward Wilfried Zaha has been charged with "improper conduct" following his red card against Southampton on Wednesday, and could face an increased suspension. The Ivory Coast international was initially given a yellow card after an exchange with Southampton's James Ward-Prowse, but was immediately shown a second for sarcastically applauding referee Andre Marriner’s decision. Zaha then continued to clap at the referee before making his way off the pitch. Crystal Palace’s Wilfried Zaha has been charged following the game against Southampton yesterday [30 January 2019]. It is alleged his behaviour following a second-half dismissal amounts to improper conduct. The player has until 18:00 on 5 February 2019 to respond to the charge. The 26-year-old's initial red card would have earned him a one-match ban but the Evening Standard claims that Zaha's conduct could earn him an increased suspension depending on Marriner’s post-match report. An official FA Spokesperson confirmed that Zaha has been charged with improper conduct following the incident at St Mary's Stadium, which the Crystal Palace star has until February 5 to respond to. Zaha actually started the match in fine form and scored the opening goal of the game with a powerful low drive past Alex McCarthy just before half time. Ward-Prowse levelled the scoreline after the break and then was involved in a coming-together with Zaha in the dying embers of the match. Zaha, who was angry that he was persistently being fouled by Southampton's players, didn't take kindly to Ward-Prowse's actions and lashed out at the England international - earning himself a yellow card. His subsequent yellow and red card for his actions towards Marriner, however, are what's landed the former Manchester United star in hot water with the authorities. Zaha will miss Crystal Palace's match against Fulham this weekend following his dismissal, but matches against West Ham and Leicester City could also be at risk if the FA decide to throw the book at him for his actions.